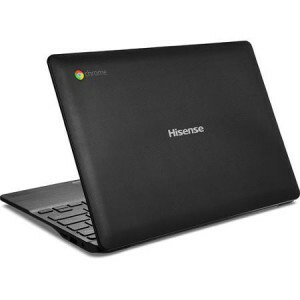 The Google company introduces its most affordable Chromebook model thus far: the $149 Hisense Chromebook. The Haier Chromebook 11 is also starting at the $149 price as well. Google has also hinted about a dongle called the Chromebit which will also bring the Chrome Operating System to any television set and/or computer monitor that has an HDMI port, and for even less money. The new Chromebook models are now available for pre-order and are set to ship out this month. These new models run quad-core ARM processors made by the Rockchip company, a Chinese semiconductor company. It also features 2GB of RAM and 16GB of ROM. Both Chromebook models have one HDMI port, a microSD card slot for expanded memory, and 2 USB 2.0 ports. They have a screen size of 11.6 inches and 1,366 x 768 pixel displays. The specifications are not going to wow anybody like the $1,000 Chromebook Pixel model may, but they are certainly sufficient models for internet surfing and light-weight computer work. The low-priced Chromebook models are targeted for emerging markets like India and China and schools. Before these new Chromebook models were released, the cheapest one available on the market was an Acer model that had a $200 selling price. (Windows also has a $200 laptop as well.) The Haier and Hisense companies may not be very well-known brand names in the United States, but they are very successful electronics companies in their home Chinese market. They are now attempting to get more visibility in the USA. The biggest differences in the 2 new cheap Chromebook models are in the battery life and the hardware styling. The black Hisense Chromebook has a battery life of nearly 8.5 hours. The white Haier Chromebook 11 model has a battery life of 10 hours.